Tres Latin Foods is recalling two batches of production of Kale & Pinto Bean pupusas and one batch of Black Bean & Sweet Corn pupusas. There have been no reports of illness to date. 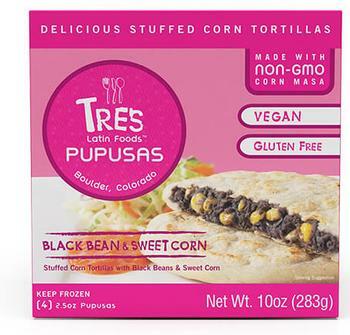 Tres Latin Foods Black Bean & Sweet Corn 10 oz. pupusas with a "Best By" date of June 19, 2018 (061918), UPC number 8-54430-00237-6. "Best By" dates can be found on the back of the package on a white sticker. Customers who purchased the recalled products should dispose of them. Consumers requesting refunds or with additional questions may contact the company at (720) 613-TRES, Monday – Friday. 9Am – 5pm (MST) or by email Questions@treslatinfoods.com.